The next piece of our Born this way series is by Csenge. Read the others' stories as well and find the series summary HERE. You can find me on the left, aged 6 or 7 playing pirate. 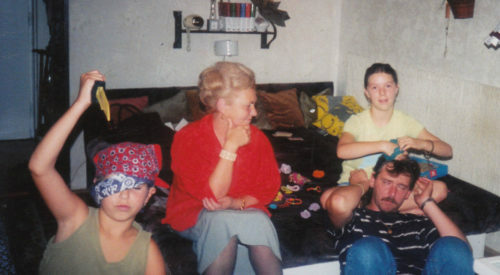 My grandma is in the middle, my sister to the right who is trying out her braiding skills on my dad (he perfected being the best dad of his daughters, and gladly let her do whatever she wanted to his hair). This picture is a great example of the difference between me and my sister. She was a typical girl, playing with Barbies, wearing pink pearl necklaces and having long hair. Me, on the other hand, loved matchboxes, I threw tantrums to have my hair cut short and had boyish looks. If you examine our childhood more closely, it’s the perfect example of boy-girl siblings. We couldn’t find the middle ground to play together, we had totally different interests. And to be fair, when I think about my childhood, there were definitely many signs that led to these sentences. Naturally, being a tomboy does not automatically mean you are a lesbian, but it might just have been an additional confirmation of a feeling in the back of my family’s mind. To my sister, whom we were never able to find common ground, I never had to come out. It’s not a big surprise, but she found out herself. You know what happened? She became mad at me, but not for the reason you would expect. She was hurt because when I finally admitted my sexuality to myself, she was not the first one I shared my feelings with. Not having common interests, we never became really close, she still thought I should have told her first. Fortunately, her anger faded away pretty quickly. Famous Hungarian lesbians – do they exist?